Doctor Who: Revisting SNAKEDANCE | Warped Factor - Words in the Key of Geek. Tony Fyler does the snakedance. Do you celebrate Guy Fawkes’ Night? Possibly not, it’s a peculiarly British phenomenon. How about Thanksgiving? How about Easter? Guy Fawkes was a religious and political revolutionary who planned to blow up a king and a seat of democracy, and was hung, drawn and quartered as a result – he is burned in effigy, still, some four hundred years later, every 5th November in the UK, frequently by children. Thanksgiving is a great American holiday of togetherness which claims descent from a peaceful meeting of two cultures - one of which would go on to intentionally exterminate much of the other. And whether in the 21st century we still believe in living gods who volunteer to be tortured and killed, Easter is the celebration of the slow, violent torture to death of a political and religious dissident in Palestine. Arguably, we have feverishly invented reasons that allow us to see this as a good thing. The point is simple – the past is rarely anything like the fluffy legends we establish in its name. That’s a key theme of Snakedance, where the Mara, last seen becoming a giant snake and evaporating in a puff of its own reflection in Kinda, is a popular figure in the local semi-mythological history of the planet Manussa. The Mara on Manussa is as real as Guy Fawkes was on Earth. As real as Jesus of Nazareth – but the giant snake was a force of incredible power, bringing the planet under its yoke and spreading chaos and desolation. That was five hundred long years ago. Now the Mara is a tourist attraction, the stuff of cheap illusions, puppet-parades and fleecing-booths, the story of its banishment by the ‘Federator’ from Earth a thing of half-truths and comfortable fictions. But the Mara still exists – just as real, just as vicious, and just as potentially deadly as ever, just waiting for the opportunity to be reborn. It’s waiting for a specific time, a specific ritual, and in some respects a specific mind to come its way to effect its rebirth. In particular it needs a ceremony in which ‘The Great Mind’s Eye’ – a large blue crystal which can draw negative emotions from people, intensify them and feed them back – is placed in a socket, linked to lines of power that allow the Mara to feed on those negative emotions, on that fear of itself. And it just so happens that that action, the placing of the crystal in the socket – is a key part of the ritual of celebration marking the Mara’s defeat, though nowadays it is re-enacted with a carefully constructed, entirely powerless fake crystal. 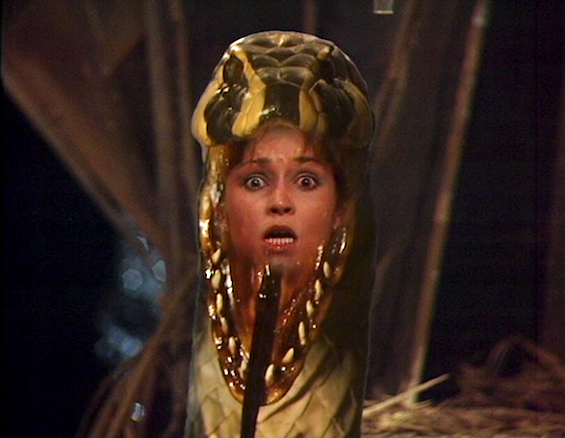 When Tegan comes to Manussa, having read out co-ordinates under the influence of the Mara in her mind, it’s the cue for another powerhouse Janet Fielding performance as ‘Possessed Tegan’, finding significance in the booths of the tourist-fleecing locals and re-establishing her full connection with the snake-spirit of seduction. But it’s when she finds Lon, the eternally bored, overprivileged descendant of the original Federator that the tension really ramps up. Lon has a key role in the ceremony of celebration, playing his ancestor. When Lon’s idle hands and mind are filled with the Mara, he sets about getting hold of the real Great Mind’s Eye, with which to bring about the return of the Mara, focusing the expectation and the darkest thoughts of his audience to give the Mara the rebirth it craves. Meanwhile, the Doctor, Nyssa and local historian Chela (played by then-rising star Jonathon Morris) have run off to the desert to meet Dojjen – a former archivist and now, following all that he discovered in that position, a ‘Snakedancer’ – a kind of snake-handling semi-Buddhist mystic. He, along with several others, including Chela, wear amulets – ‘Little Mind’s Eyes’ to help focus their thoughts to a point of neutrality. One of the great things about both the Mara scripts written by Christopher Bailey was the cogency of their morals. The Mara is a spirit of seduction, a life force powered by the needs and wants and desires of others. Whereas in Kinda it was defeated by the idea that evil, knowing its own nature, cannot face the sight of itself (a conscience metaphor alive and well today in Eastern philosophy), in Snakedance, there’s an anti-materialistic feel to the moral – to defeat a creature that only grows stronger the more you desire, you must find the still point in your mind, the point of no desires. If you have no desires, you can have no fears, and you starve the Mara of its life-force. When Lon and Tegan bring about the becoming of the Mara (a much more effective and creepy giant snake this time round than in Kinda) by using the real great crystal, the Doctor, under Dojjen’s tutelage, uses the Little Mind’s Eye to set up interference between the Mara and the people it would use to grow in our universe. Even when the snake uses Tegan’s real voice, her desperate, pleading, tiny voice, the Doctor will not submit, and so at the moment of its becoming, the Mara is once again banished. 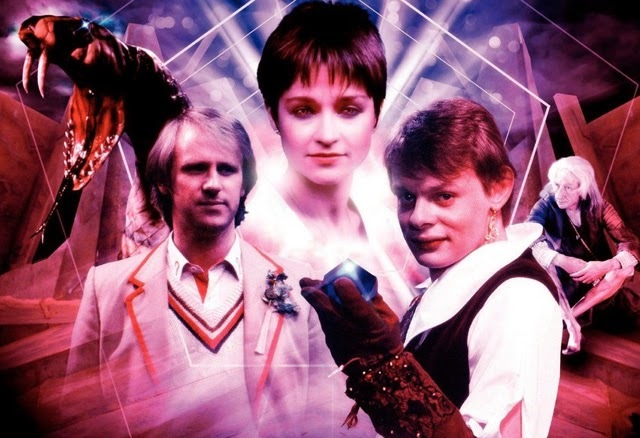 Of the two Mara stories during the Fifth Doctor’s time, Kinda gets more love from fans than Snakedance, for its portrayal of an indigenous culture and a military scientific observation team and what happens when worlds collide. There’s good reason to love Kinda, certainly – in particular, Nerys Hughes as the scientist Todd, for whom the spirituality of the Kinda is mystifying but not objectionable, the powerful mental breakdown suffered by Simon Rouse’s Hindle, and the utterly creepy work done by Jeff Stewart as Dukkha, the voice of the Mara inside Tegan’s head. Janet Fielding too does superb work in Kinda, taking the story to places Doctor Who was rarely confident enough to go. But Snakedance is by no means the weaker of the two. In the set-up of a society grown indolent and privileged on the legends of its past, in the philosophical lessons it teaches about desire and stillness, and in particular in some of the performances, it’s more than the equal of its predecessor. 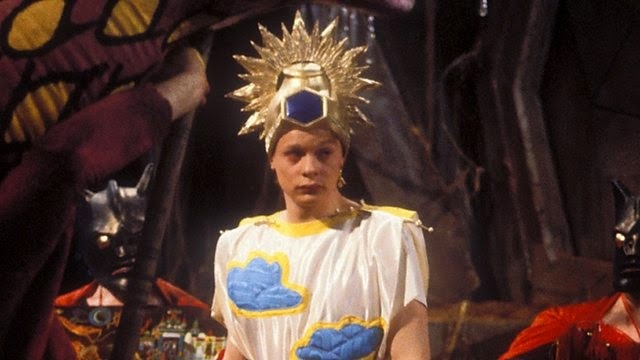 Special mention has to go to a young Martin Clunes, who, while dressed in the most clownish outfit of the decade that style forgot, still manages to channel real menace in the climactic scenes of the Mara’s becoming, as well as pitching his bored young nobleman perfectly in the scenes which establish the kind of mind the Mara needs to achieve its rebirth in the world – a mind for whom nothing is ever satisfying, for whom too much is never enough, and for whom there is no stillness even in childish indolence. While the moral of the still point is the one that most people take most easily and readily from Snakedance, the idea that bad things happen when we paint out history in cosy, fluffy colours is equally important. While there may be no Mara waiting to slither through the cracks of our cultural ceremonies (though people who believe in a literal Devil might tell you otherwise), if we forget the dark actions of our ancestors and how they’ve influenced our societies, we always run the risk of assuming a moral superiority about our positions, and of committing dark acts of our own, to thrill the Mara in us all.